What is Add fractions ? : The sum and difference of like fractions is a "fraction with the same denominator and the sum and difference of the numerators as its numerator". If this resultant fraction is not in its lowest terms, reduce it to its lowest terms. 1) In a vegetable garden 1/6 of the area is covered with lettuce and 5/12 with tomato plants. What fraction of the area is planted with these? 2) A brick weighs 2 1/5kg . A stone is 1 1/10 kg.Find the total weight of stone and brick. 3) Roger mixes 1/2 liter of water with 1/8 liter of orange squash. How much mixture does he get? 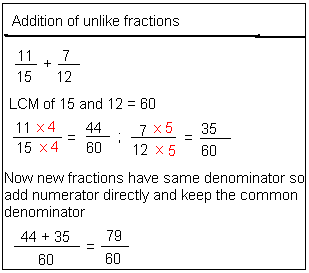 As these are unlike fractions so first make the denominators same for each fraction. So, the quantity of mixture is 5/8 l.